Recently I was relayed the story of his childhood. At the sprightly young age of 7, his father passed away, leaving behind his mother, his younger brother and himself. One night while his mother was sleeping, her family kidnapped her and forced her into marriage (read: sold her) to another man. So a new husband she had. Unfortunately, she was only allowed to take one son, her youngest, which left my grandfather orphaned. In China, the concept of family extends far beyond that of the nuclear family, so you would expect some of his cousins or uncles or aunts would take him in but they did not. Instead they took the land that was rightfully his (from the death of his father), saying he was too young, and abandoned him. When I was younger, I wanted to fit in so badly with the other kids. I didn't like the fact that I was different: my skin was yellow instead of pink, my eyes looked "weird", my mom would make me smelly Chinese food for lunch. I was stupidly ashamed of my background and my culture. These days I couldn't be more proud of where I come from, of what my grandparents and my parents were able to accomplish so that I can safely sit behind the glass of my first world privilege and never know the suffering they knew. That the biggest problem I have is the cost of rent in Brooklyn and my cats waking me up too early in the morning. So thank you grandpa, for your hard headed, iron clad will to survive, thank you for letting your children get an education because you realized the hardship of never having one. Even though mom tells me stories of only having thinned out rice porridge and preserved vegetable rations to eat when she was growing up, I hope you had the pleasure of eating well later in life, maybe you even enjoyed a tasty baozi or two. You can find cellophane noodles at any asian grocery store. They look similar but are quite different from thin rice vermicelli, so make sure you grab the right one. Cellophane noodles (or glass noodles, or bean thread) are made generally from mung beans and they hold up well when cooked. Any leftover filling can be stored in the fridge for up to 2 days. I generally like a high filling to bun ratio so I don't usually have leftovers, but you might if you prefer it the other way around. If you have never folded a baozi before, there are plenty of great youtube videos to reference and learn the technique (I'm still terrible at it). Makes 14 to 15 buns. Prepare 15 squares of parchment paper, each measuring about 2 & 3/4 inches in width and height. Combine yeast, warm water, and 1/4 tsp of granulated sugar in a liquid measuring cup. Stir to dissolve and let sit for 5 minutes until bubbly on top. Sift the remaining sugar, baking powder, and flour together in a large mixing bowl. Add the oil and the activated yeast mixture to the flour and stir with a spoon or spatula until a lumpy dough forms. Once it becomes difficult to stir, use your hands to knead the dough, adding more flour if the dough is too sticky or water if it's too dry one teaspoon at a time, until it comes away cleanly from the bowl. Turn the dough onto a clean counter and knead by hand for another 5 minutes until smooth and elastic. Return dough to the mixing bowl, cover with plastic wrap, and let rise for 45 minutes to 1 hour until doubled in size. In the meantime, making the filling. Place the cellophane noodles in a heatproof bowl and add enough boiling water to submerge the noodles completely. Drain the noodles after two minutes, they should be soft but not mushy. Once cooled, roughly cut the noodles into 1 inch segments. 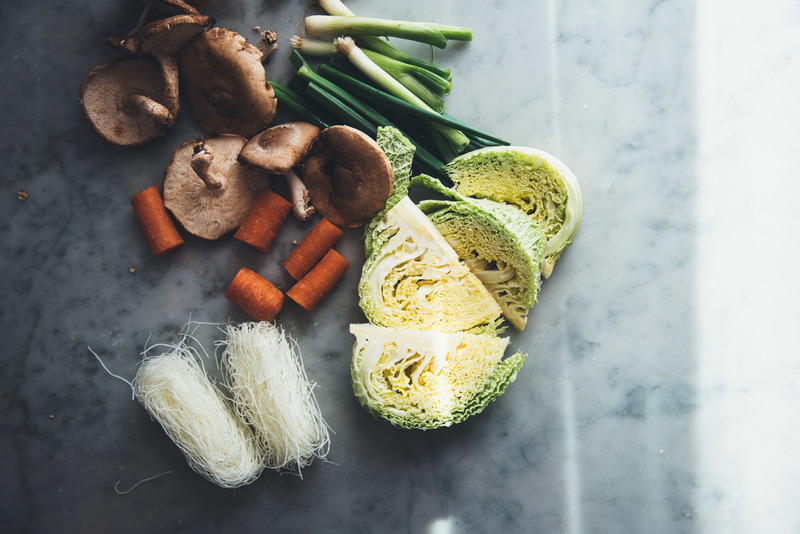 Place the noodles, chopped cabbage, mushrooms, carrot, and scallions in a large mixing bowl. Add sugar, soy sauce, oyster sauce (optional), olive oil, sesame oil, and salt. Stir to combine, taste, and add more salt as needed. Cover and let sit until ready to use. Once the dough is ready, turn it onto a clean counter once more and press out any excess air. Roll the dough into a log and start cutting off segments measuring about 1.5 oz each. This should give you about 14 to 15 small pieces of dough. Work with one piece at a time, covering the rest to keep them from drying out. Roll out the dough into a circle, 4 to 5 inches in diameter with the middle being thicker than the edges. Take the rolled out dough in one hand, place 2 spoonfuls of filling in the middle, and start pleating and pinching the edges together until you have formed a closed bun. Place the completed buns on a parchment paper square and set aside, covered. Repeat until all the pieces of dough have been filled. Let the buns rise for 30 minutes (though if you are slow like me, your first few buns will have finished rising by the time you finish the last few, so you can start steaming them right away in batches). Place the buns, parchment paper and all, into your steamer basket, leaving about 1 inch of space between each bun. Fill a pot with water and turn the heat to high. Once the water starts forming small bubbles at the bottom of the pot but before it starts boiling, gently lower the steamer into the pot and steam for 15 minutes until your baozis are big and fluffy. If you are steaming in batches, refill the water as necessary and repeat the process. When finished, remove from heat and enjoy immediately.